A hydraulic cylinder is a mechanical actuator that gives a unidirectional force through a unidirectional stroke. The word actuator here is used to mean a “mover”, or basically any component of a machine that moves or controls a specific mechanism or system. Hydraulic cylinders are also called linear hydraulic motors. They have many applications, such as being used in a wide variety of construction equipment, in machines used within the manufacturing industry, and in civil engineering. They also have a few domestic applications. The cylinder barrel is the seamless chamber that ensures pressure is contained. The inner chamber of the barrel is usually has a very fine surface finish of between 4-16 microinches. This reduces friction and allows the relatively free movement of the piston as it moves upwards and downwards in the chamber. The cylinder cap is the part of the hydraulic cylinder that keeps the pressure in. It stops pressure from getting out of the chamber during the motions of the piston. This is achieved by simply closing off one end. The cylinder cap also acts as cylinder mounting parts. These parts include the cap clevis, the cap flange and the cap trunnion. Through these, the cap can be attached to the body by welding, threading, bolting or connecting using a tie rod. For all these joinery methods apart from welding, a seal ring is required to be placed between the cap and the cylinder barrel. The size of the cylinder cap is calculated from the bending stress of the member. The cylinder head is the part of the hydraulic cylinder that is on the other end of the cap. The cylinder head is typically attached to the body through threading, bolting, or using a tie rod. A static seal is usually used between the head and the cylinder barrel. The cylinder head keeps the pressure inside the barrel using an integrated rod sealing set up, or, if the situation allows it, a seal gland. The piston is the part that is attached to the piston rod which separates the two sides of pressure in the barrel. The low-pressure area and the high-pressure area should never meet, and it is the role of the piston to ensure this does not happen. The piston is usually attached to the piston rod using bolts, nuts or threads, enabling the transfer of linear motion. Normally, a piston contains groves that allow for the fitting of isometric rings. These isometric rings can either be single acting or double acting. Through the function of the piston, the cylinder can extend and contract with the reciprocating motion of the cylinder. The piston rod is the part that connects the hydraulic cylinder to the machine component doing the work. They are connected using a machine thread or a simple mounting attachment. Piston rods are usually made of cold rolled steel that is hard chrome plated. They attach to the piston and extend to the rod end head. For double-rod end cylinders, there is a rod extending from both sides of the piston and exiting the cylinder barrel on both sides. The seal gland has five components: the primary seal, the secondary seal, the bearing elements, the wiper and the static seals. Seal glands are placed in the cylinder to stop pressurized oil from leaking past the connection between the rod and the cylinder head. Small hydraulic cylinders usually come with seal glands that have the rod gland and the bearing elements made from one integrated part. Seals come in many varieties performing different functions. This is why the type of seal you use depends on what you want to achieve. Some of the functions different types of seals perform include regulating cylinder speed, operating temperature, and cylinder working pressure. Some types of seals include piston seals which can be single acting or double acting, metallic seals which are made of cast iron, rod seals which are single acting, and wipers whose function is to remove contaminants like dirt, dust and moisture that can potentially damage cylinder components. When seals are made from nitrile rubber or polyurethane, they work better in low temperatures. When they are made from fluorocarbon viton, they work better in higher temperatures. Hydraulic cylinders work by generating linear force and motion from a hydraulic fluid that is under pressure within them. They can either be single acting or double acting. Single acting hydraulic cylinders are the simplest kind. They work by allowing the hydraulic fluid to enter into the barrel at one end of the cylinder. This extends the piston rod. Then, through the application of an external force or the use of an internal force or gravitational force, the piston rod is returned to its original position. Double acting hydraulic cylinders are a little different. They typically have a port on each side. Through these ports, the barrel is supplied with hydraulic fluid. This hydraulic fluid is what is used for either the retraction or extension of the cylinder. What Are The Different Types Of Hydraulic Cylinders? 1. Tie rod cylinder: This type uses has high strength steel rods that hold its two end caps to the barrel. They are not customizable, and can easily be disassembled and repaired. 2. Welded body cylinder: This type of cylinder has no tie rods. The barrel is welded to the end caps. Only the front rod gland is threaded or bolted to the barrel, which makes it possible for the piston rod and the seals to be removed and serviced. What Are Some Common Applications Of Hydraulic Cylinders? As stated earlier, hydraulic cylinders can be seen in action in almost all major construction equipment. Excavators, bulldozers, cranes and backhoes all use hydraulic cylinders. Trash dumpsters and mechanical rams also make use of hydraulic cylinder components. Normal vehicles also have hydraulic brakes and callipers. Forklifts and jacks in industrial applications also take advantage of hydraulic cylinders. When it comes to domestic applications, mechanical log splinters make use of hydraulic cylinders to split firewood so that you do not strain your back swinging an axe. 1. The Cylinder Barrel, which is where the pressure is contained. 2. The Cylinder Cap, which keeps the pressure in the barrel. 3. The Cylinder Head, which works with the cap to keep the pressure in the barrel. 4. Piston, which exerts the pressure. 5. Piston Rod, which transfers the force onto the piston. 6. Seal Gland, which stops pressurized fluid from leaking past the connection between the rod and the cylinder head. 7. Seals, which prevent the cylinder fluid from escaping during the motion of the piston. 8. Other Speciality Parts, which vary from hydraulic cylinder to hydraulic cylinder depending on function. 1. 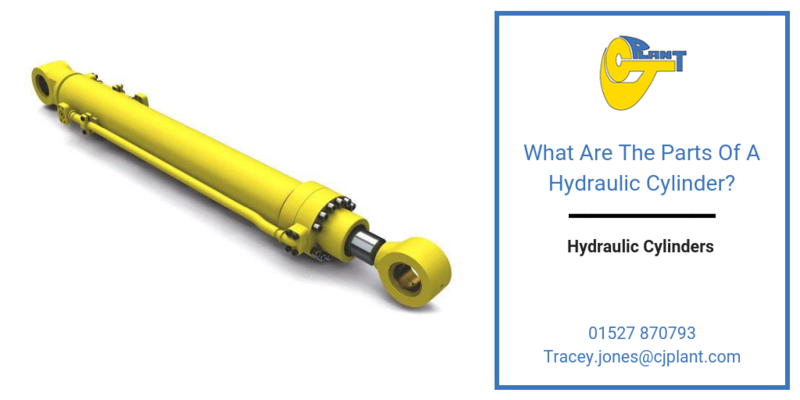 How many types of hydraulic cylinders are there? Cylinders can either be single acting or double acting. From these two types, we can get four variations. The first is simple single acting cylinders, which are perfect when you have a force acting in a single direction. The second type is simple double acting cylinders. These are more common and popular than single acting cylinders due to their ability to work at any angle. The third type is the piggyback cylinder. This type uses two cylinders in opposite direction welded together. This makes it possible to have twice the stroke in half the space. Finally, we have the telescopic cylinders. These can either be single acting or double acting and work by allowing for a longer stroke in a much smaller space. 2. What Are Hydraulic Cylinder Rods Made Of? The hydraulic cylinder rods are made of hard chrome plated steel. Their strength specifications and requirements usually depend on the purpose of the cylinder itself. 3. How Does A Hydraulic Cylinder Work? Put simply, hydraulic cylinders work under Pascal’s Principle. Pascal’s Principle basically states that the pressure exerted on a fluid will be distributed evenly throughout the fluid. In a hydraulic cylinder, the fluid used is in-compressible. This makes the pressure exerted on one end to be distributed and exert a desired resultant pressure on the other end.